Being a big fan of Italy and its cuisine, you can never go wrong here. 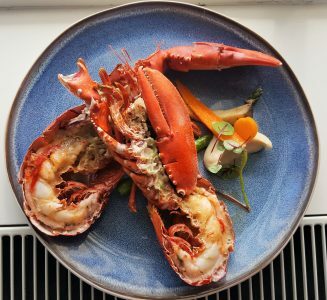 I love this restaurant because besides the traditional food, they also serve numerous suggestions which are far from standard and changing every 6 to 8 weeks. First of all I need to apologize for the terrible quality of the pictures, I’m working on that and will change it a.s.a.p. Coming in to this restaurant it feels like coming home, a nice interior, fine people greeting you at the entrance with a warm “buona sera”, and so much wine bottles hanging from the wall. Small problem is the knowledge of different languages besides Italian or French, but they understand you would like to see a menu after coming in. Getting a nice Amaro for me and an Aperol Spritz for my wife as a starter makes you hungry within a minute. Looking at the suggestion menu, it was easy to choose. Because I just love strange and unconventional combinations it was very easy to make my decision. 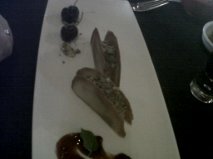 As a starter I had the magnificent “Foie gras” in a crust of pistachio nuts, on a “thule”cookie with wild cherry sauce. Just perfect balance and a great dish! Good combo of sweet and sour, right amount of acidity and a fresh, probably homemade liver. Then it was time for 2 suggestion wines, a white wine for my wife called Ca’ Bianca form Piemonte, made from the Gavi grape. Not so great and a bit flat. For me a Planeta form Sicily, made from Syrah. At a price of €8 a glass, it must be good, and it was! With a strong Cherry nose and oak taste it was a nice strong wine with many flavors developing during the main course. 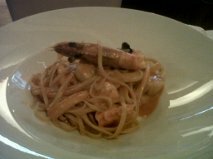 As a main course she had a Linguini “Gambero Rosso” with scallops and prawns, the seafood cooked to absolute perfection as well as the pasta, only the flavor was a bit blend and disappointing. Meaning the seafood had a pure taste, but overall the total dish missed some spice or kick to it. 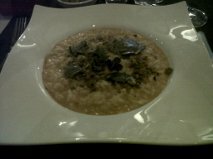 For me the Risotto I just could not resist, with summer truffle, Peccorino, smoked salmon and a pistachio crumble. What a great dish for me, absolute strange combination but I think a success. Having a good combination between especially the salmon and the truffle the full dish just was as it should be. Maybe the traditional Italian wont except it, but I like this kind of fusion cooking! Finishing with some cheap Grappa on the house, we had a good dinner. Always nice to come here with good food and great wine. Only critical point are the portions which are pretty small and the price which, for these portions, is pretty high. Total price for 2 was €78, a bit on the high end, but still worth it. I still can recommend this restaurant!